Since the turn of the 21st century, it’s fair to say De La Salle University has gone unrivaled in the UAAP women’s volleyball division. Led by arguably the greatest head coach ever in Philippine volleyball, Ramil De Jesus, DLSU has won 11 titles since 2000, UAAP Season 62. The team closest to them is FEU with 4 titles, while UST and Ateneo are behind with two championships each. In 2019, UAAP Season 81, La Salle has the rare opportunity to add another feat to its historic record book. Another title for the Lady Spikers would be their 12th in the last 20 years, but more significantly, it would be the first time a UAAP team will achieve a 4-peat in the Final Four era (est. 1993). The last team to win at least 4 consecutive championships was UST, who were the queens of UAAP volleyball for 5 straight seasons from 1987-1991. Ironically, DLSU has come close to winning 4 straight championships twice: in Season 69, when UST usurped them from the crown; and in Season 76, when the Alyssa Valdez-led Ateneo Lady Eagles started their string of two straight championships. Is it true that third time’s a charm? That remains to be seen. For La Salle to win another title, De Jesus will have to pull off one of the best coaching jobs of his career, given that his Lady Spikers are welcoming 9 rookies to the roster. One thing DLSU has going for them is that Michelle Cobb, who handled starting setter duties full-time last season, is now a veteran who can pass on her knowledge to the younger girls. “I guess it’s bigger compared to the past season since we’re aiming for a 4-peat now, and parang history says it hasn’t been done before – the 4-peat, diba? So I guess it’s bigger, it’s stronger, the pressure is there, and it’s more intense,” she said. 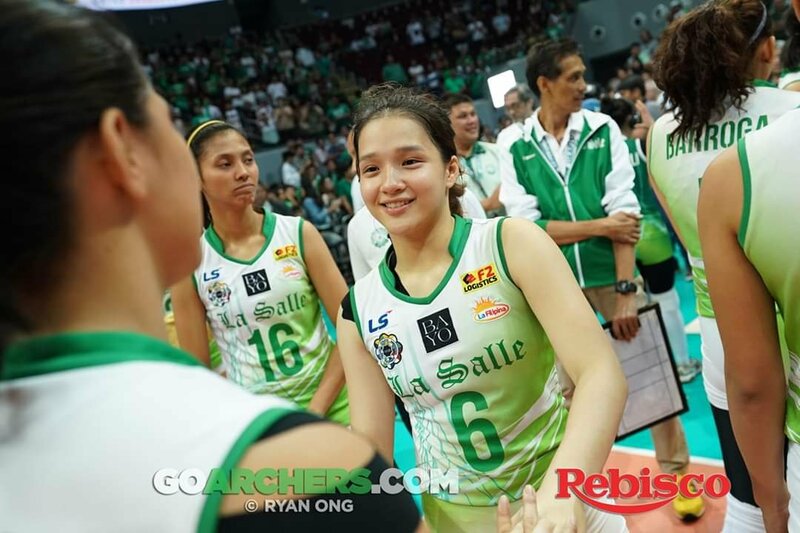 What’s more challenging for La Salle is that former league MVP Majoy Baron, former Finals MVP Kim Dy, and former Best Libero Dawn Macandili played their final year of eligibility last season, when DLSU swept FEU in the finals. With the star trio gone, La Salle will rely on veterans like Cobb, May Luna, Tin Tiamzon, Aduke Ogunsanya, and graduating team captain Des Cheng to continue La Salle’s tradition of role players becoming big-time contributors. For Cobb, it helps that La Salle’s roster has gained some experience playing together in the preseason already. “I guess I have to mention lang the fact na we joined the commercial league, the PSL (Philippine Superliga), cause our first 6 now was exposed to that league, so parang I guess that was like a starting point rin to our connection, to our relationship, now that the 3 are gone,” she said. Cobb’s role will be pivotal for continued La Salle success. Aside from setting up her teammates for scoring opportunities, the elder Cobb will now have to also play the part as a guiding voice for a young team. “For me I guess it comes naturally rin, like parang it doesn’t feel like a chore… it doesn’t feel like weight on my shoulders. Parang, it’s something na I expected rin to come,” she said. With the way she takes care of business on the court, and taking into account how well she carries herself off it, there’s little doubt Michelle can be the leader DLSU needs her to be.